Victorian Lovelies are planters meticulously hand-sculpted with a charismatic presence! The functional indoor planter consists of two pieces - the head acts as a holder for soil (with a drainage hole inside) while a coordinating dish catches excess water below, perfectly integrated as a part of the overall appearance. Petaluma Lady is encompassed in lovely sculpted petals, features an inviting smile, blush cheeks, and a ladybug collar. The finish is completely fired and water safe. The planting cavity is approximately 5" wide x 3" deep, perfect for small indoor plants. Artisan-crafted one-at-a-time in California and signed by the artist. Please note: Petaluma Lady is individually hand-thrown, sculpted and carved. Slight variations in the facial details and dimensions may occur, reflecting the individual handmade nature of the item. Recommended for indoor use only. Plant not included. 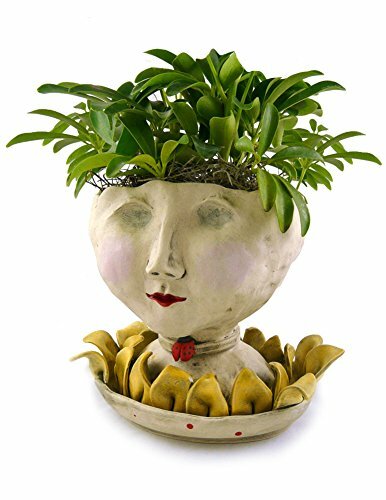 Victorian Lovelies are planters meticulously hand-sculpted with a charismatic presence! 6.5" high x 7.5" wide ; Individually handcrafted in the USA and signed by the artist.